We walked down a spiral stone staircase and felt the temperature drop with every step. The Paris sun above had been blistering hot and we welcomed the break away from the heat for a while. We walked slowly through the dimly lit tunnels for a while, a little less impressed than I had expected. Then just as I started to wonder what the big deal was about, we walked into the next section and there it was, stretching out through the passageway. A German kid reached out with a single finger and poked around inside the eye socket of a human skull. A man with a thick french accent called out in english "Do not touch the bones, this is a cemetery!". The kid pulled his finger back out and moved on until out of site of the skullkeeper, then continued to fondle and prod as many skulls as he could until being told off again, this time from a voice in the darkness that made him jump. 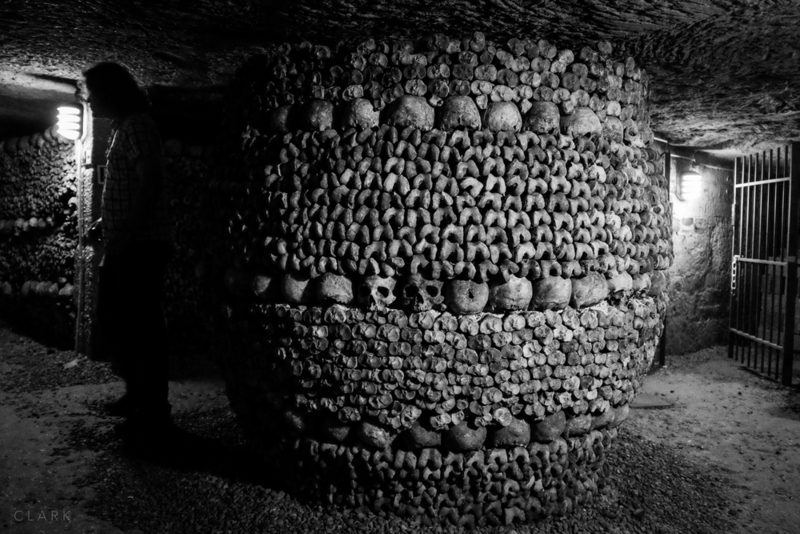 The skeletal remains are expected on this trip underground, but it's the sheer volume of them that is shocking. The bones from all the cemeteries in France were brought here between 1786 and 1788, always at night under a black vail and lead by priests. 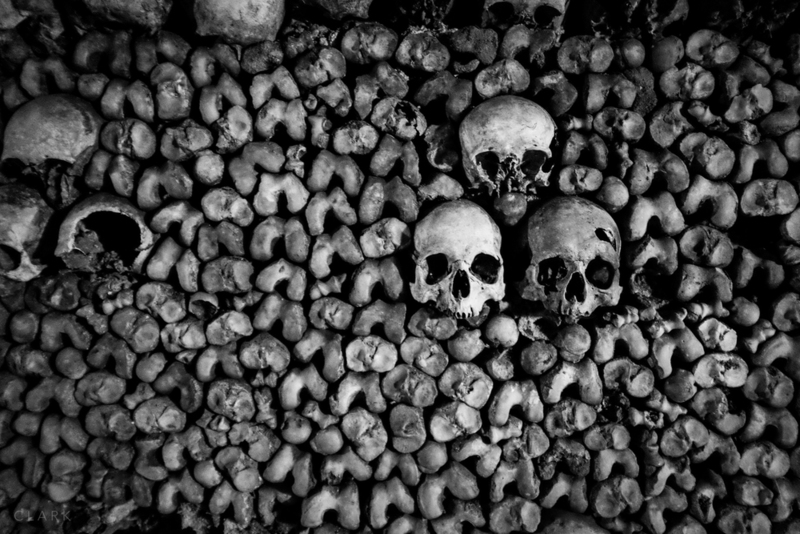 Walls of bones and skulls are stacked neatly into walls 5' tall (sometimes floor to ceiling) and at least as deep. There's even the odd roundabout made of bones. 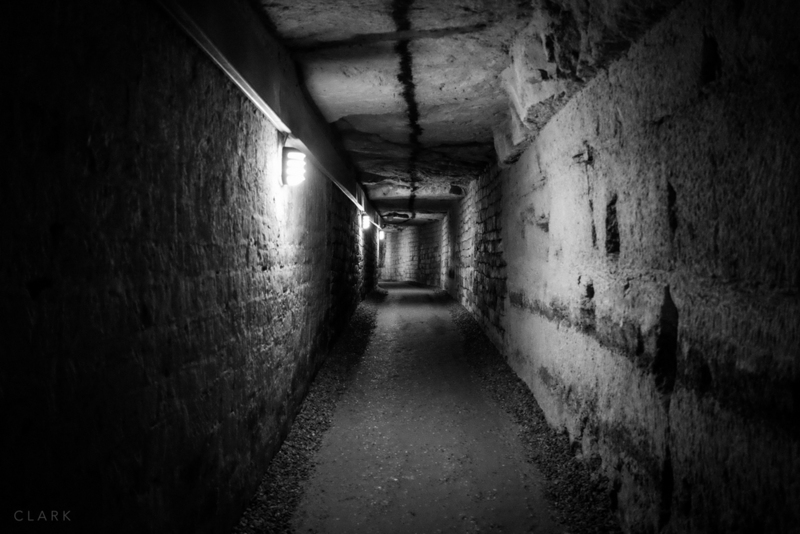 The tunnels stretch for miles below the streets of Paris, under blocks and blocks of houses. Oddly, I came across a small pile of old photos placed on top of a stack of bones. These were the last things I expected to find here and they were like an electric shock, a sudden realisation that all of those bones were once regular people, families with kids. Then suddenly another stone spiral staircase rises steeply in front of us. The climb felt never ending and after days of walking the streets of Paris, my calf muscles could have done without the haul back up to the streets. A quick security check to make sure my camera bag didn't contain the odd skull and we were outside again in bright sunlight and fresh air. I had no idea where we were, but I knew we had travelled a great distance underground. I glanced back, wondering if the German kid would emerge from the staircase holding a skull like a bowling ball, but he was nowhere to be seen.